Distract your cat from tearing up your furniture or curtains with this mouse chaser. Place the electric cat mouse game disc on the floor or table, press the switch, the yellow mouse will move around in the tunnel back and forth to hide, so as to stimulate the cat’s natural instinct to hunt. 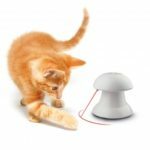 It&apos;s a sure way to keep your kitty&apos;s interest and an even better way to keep her engaged. Made of environmentally friendly ABS material, sturdy construction stands up to vigorous play. Four speed levels ( fast, medium, slow and random) for the mice rotation. 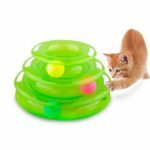 360 degrees non directional rotating design, providing exciting fun for the kitties. 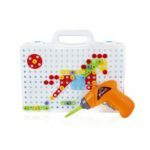 Worked with 3 x AA batteries, safe and save your worries from electric shock. You can also bind some food treats ans small toys on the mice for your feline to hunt for.